This paper describes how the Cormas platform has been used for 12 years as an artefact to foster learning about agent-based simulation for renewable resource management. Among the existing generic agent-based simulation platforms, Cormas occupies a tiny, yet lively, place. Thanks to regular training sessions and an electronic forum, a community of users has been gradually established that has enabled a sharing of ideas, practices and knowledge, and the emergence of a genuine community of practice whose members are particularly interested in participatory agent-based simulation. A multi-agent system (MAS) is a metaphor of reality (in its social, biological and physical dimensions) that views a socio-ecosystem as a set of interacting autonomous entities located within an environment. To make their decisions, these objective-driven entities refer to specific representations of their environment (Ferber 1999). When applied to ecosystem management, this paradigm enables the representation of relationships between stakeholders with regards to renewable natural resources (Bousquet and Le Page 2004; Le Page et al. 2011). Most domain models related to the management of renewable natural resources share certain similarities, and the MAS paradigm can be used to design them. Indeed, the environment corresponds to a portion of space that contains certain resources which abundance and quality may change according to intrinsic dynamic processes. Stakeholders, groups of stakeholders and/or institutions (any kind of entities making decisions somehow related to the resources) are represented as computer agents interacting with both the environment and the other agents (Bousquet et al. 1999; Janssen 2002). An agent-based simulation model refers to the concrete model implemented with a computer programming language. It is used to simulate in silico the evolution of the domain model, namely the socio-ecosystem represented as a MAS. There is a bewildering abundance of terms found in the literature to refer to this kind of MAS application in environmental management. This point has been stressed by Hare and Deadman (2004), whose recommendation to use the neutral umbrella term "agent-based simulation" (ABS) will be followed in this paper. In the mid 90s, faced with the task of developing models to represent several specific socio-ecosystems, the modelers in the CIRAD Green research unit felt that it was worth building on existing work by providing a set of functionalities to facilitate the process of designing agent-based models and of running simulations. Cormas (Common-pool Resources and Multi-Agent Systems), a generic agent-based simulation platform, was therefore implemented in 1997 based on the object-oriented programming language Smalltalk (Bousquet et al. 1998). As it would have to address natural resource issues, the platform's space representation functionalities were deemed to require particular attention. In Cormas, elementary spatial entities are either raster cells or polygons organized across hierarchical levels: lower-level spatial entities can be aggregated to create compound spatial entities whose components are defined as sets of contiguous elementary spatial entities filling a shared condition. To facilitate the design of realistic virtual environments, a link between Cormas and the more widely used Geographical Information System software was also established through an asynchronous operation of functions within each system that enable file-based data exchange. By the late 90s, people who were not members of the initial core group of Cormas designers started to use the platform. In this paper, we suggest that the Cormas user community operates as a community of practice fostering efficient learning on agent-based modeling and simulation for renewable resource management. We discuss the crucial role of training sessions on multi-agent systems for natural resource management, where Cormas plays a key role, and then we analyze the scientific production of the community. Before that, in order to position Cormas, we provide an overview of the existing agent-based simulation generic platforms. Software frameworks provide abstractions and mechanisms for the definition of agents and their environments to support their interactions, but also additional functionalities like simulation management (set-up and scheduling), its visualization, monitoring and the acquisition of data about the simulated dynamics (Gilbert and Bankes 2002; Bandini et al. 2009). Such generic ABS platforms facilitate the process of converting a conceptual agent-based model (a model framed by referring to the multi-agent system paradigm) into a ready-to-run computer simulation model. Among the recent comparative reviews of existing ABS platforms some are rather general in nature (Railsback et al. 2006; Nikolai and Madey 2009), while others focus on a specific domain like geosimulation (Castle and Crooks 2006) or social simulation (Gilbert and Bankes 2002; Tobias and Hofmann 2004). We briefly present here the most cited ABS platforms to contextualize Cormas. Ascape, developed in the USA at Brookings Institution (Parker 2001). Mason, developed in the USA at George Mason University (Luke at al. 2005). Repast, created in the USA at the University of Chicago and subsequently maintained by organizations such as Argonne National Laboratory (North et al. 2006). Swarm, developed in the USA at Santa Fe Institute (Minar et al. 1996). However, inadequate programming skills remain an obstacle to the use of ABS for many researchers (Railsback et al. 2006). Indeed, many potential users of ABS platforms are not familiar with computer programming. Scientific university programs often neglect basic programming skill development, and this is true in many fields in which ABS is used. NetLogo, developed in the USA (Wilensky 1999), leaned towards simplicity by providing a very simple programming language (a "script") that does not require a background in informatics, and is aimed at attracting non specialists (non modeler scientists as well as scholars) so that they can learn about complex systems by writing programs and/or running computer simulations by themselves. The Cormas development team at CIRAD (Bousquet et al. 1998) opted for Smalltalk to develop the platform and design the models despite certain reservations concerning the relatively small community of Smalltalk developers (Tobias 2004). However Smalltalk provides some clear advantages over other languages. As this language is purely object-oriented, its inherent logic is easier to pick up, however for people who are used to other programming languages, its logic can be counterintuitive. Smalltalk has been said to be the best beginner's language (Kühne 2001) and the debugging of a Smalltalk program is a learning process in itself. When a bug stops the execution of the program, a live inspector window pops up and provides contextual clues to help resolve the issue. This gives the trainee programmer a more intimate vision of how Smalltalk works. To assess how the use of ABS platforms grew over the last decade, we conducted a survey with Google Scholar on September 24, 2010 by searching for articles with the exact phrase "agent-based simulation". Only year-referenced articles were recorded, with no verification of the relevance of each reference and the results shown in figure 1 should therefore be considered with caution. After a decade of steady growth, agent-based simulation seems to have reached its peak in popularity. To get an idea of the rate of ABMs designed with a generic simulation platform, we extracted ABS publications mentioning one of the most frequently cited tools (Ascape, Cormas, Mason, NetLogo, Repast and Swarm). Today, more than half of the publications related to ABS are also related to one generic simulation platform. We used Google Scholar once more on September 24, 2010 in order to record the number of dated citations of the seminal papers for the 6 ABS platforms described above. We propose to define a platform popularity index based on the average number of citations per year since these seminal papers were published (see table 1). 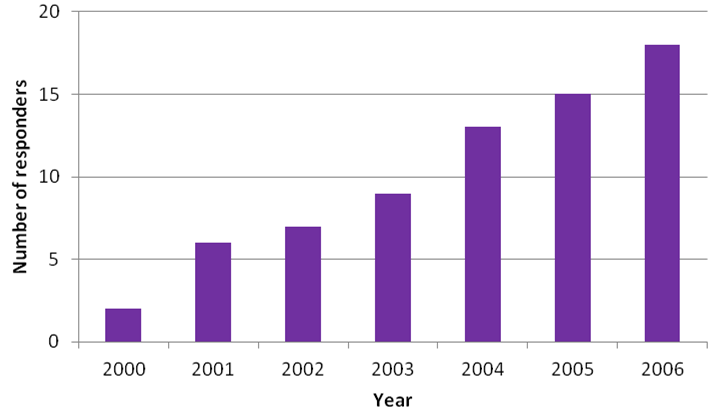 Figure 2 shows the evolution of the number of platform seminal paper citations. Swarm, which was a pioneer, remains a major reference, but it seems to have been overtaken by Repast and NetLogo. Since the beginning of the last decade, Cormas has been used by a relatively small community of users. However, this is mitigated by the fact that members are very loyal and active. A community of practice (COP) is any group of people whose members have a common interest in a subject, problem or goal; through collaboration and sharing of ideas, practices and knowledge, they improve their skills in a particular common domain (Wenger 1998). In addition, they usually develop common language and jargon, concepts or tools that are typically understood just by the members (Lesser and Storck 2001). Shortly after the first version of Cormas was released (late 90s), an electronic forum was set up to nurture a community of Cormas users and a two-week training session was developed so that people interested in the Cormas platform could improve their individual skills through exchanging and sharing a pool of resources. A member of the Cormas community is defined as someone who attended (at least) one training session and/or once subscribed to the electronic forum (see the proposed typology based on these two dimensions in table 2). Figure 3 shows that 57% of the Cormas community members (N = 759) attended a training session. Most of them never subscribed to the forum. Nevertheless, the electronic forum has played a key role as 40% of the members joined the community through the forum. The electronic forum paved the way for the setting-up of a genuine COP. The forum was assessed by Guechtouli (2009) who used the Cormas user community to validate a theoretical agent-based model that investigated communication and knowledge transfer within a COP (Guechtouli 2008). 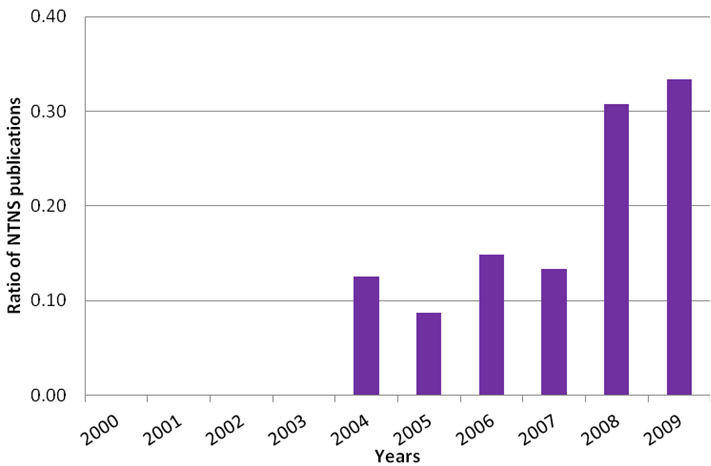 Reviewing all the 967 messages sent to the Cormas forum between 2000 and 2006, Guechtouli found 289 messages dealing with technical aspects related to the platform and noted that the number of responders to technical questions on Cormas had steadily increased during the period of her survey (see figure 4). From October 1997 to July 2010, a total of 548 persons attended 51 training sessions based on practical exercises using Cormas, and 53 of these trainees (9.7 %) attended more than one training session (usually a combination of the general 2-week course on "multi-agent systems for natural resources management" with a dedicated 1-week course on Cormas). Most of the trainees were scientists from various disciplines (agronomy, ecology, economy, geography, social sciences), while around one third of attendees were PhD and master students. 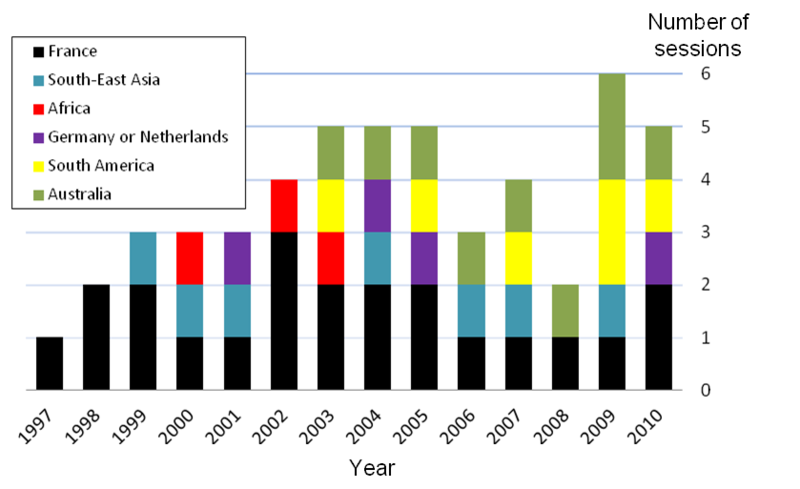 Most Cormas community members are French, however several training sessions on Cormas and multi-agent systems for renewable natural resources management have been delivered internationally (see figure 5). Training sessions were regularly organized in Europe (45% of the training sessions have been given in France), with regional networks emerging in South-East Asia (14%), in Australia (15%), and in South America (12%), through the setting-up of collaborative projects involving researchers from the Green research unit hosted by partner institutions. Table 3 displays the original 2-week course format that was used between 1997 and 2005, where 20% of the time was allocated to learning about Cormas (incl. Smalltalk), 30% on prototyping personal ABMs with Cormas, 12,5% on case studies, 22,5% on lectures and 10% on Role-Playing Games. Altogether, half of the time was directly focused on mastering the simulation platform. This was accomplished through training based on a didactic model during the first week (spreading of a forest fire with a Cellular Automata, introduction of reactive and then cognitive fireman agents) and then through the implementation of specific prototype models by groups of 2 to 3 trainees during the second week. If we consider that programming language proficiency cannot be taught but must be learned (Kühne 2001), this mix of objectivist design (during the first week) and constructivist design by means of personal projects (during the second week) was aimed at shifting the emphasis from teaching to learning. Moreover, Cormas models were demonstrated in both case studies and lectures. For the latter, a library of didactic models was progressively established, with some creations and some replications of standards, like the spatial prisoner's dilemma game (Nowak and May 1992), to introduce the basic concepts of game theory and cellular automata, or foraging robots (Drogoul and Ferber 1992) to teach cooperation with reactive agents. As with the electronic forum (see figure 4), certain trainees played an important role in boosting the community. Prototype models, which were developed by participants during training courses, became material to be used in later training sessions. For instance, a theoretical model was prototyped in December 1998 to investigate the dynamics between individual and collective representations in an agent-based "forest" model (Bonnefoy et al. 2000), and the Dricol ABM (Thebaud and Locatelli 2001) was prototyped in May 2000 to explore the emergence of resource-sharing conventions. Trainees today are asked to replicate these models in order to learn the methodological steps involved in taking a conceptual agent-based model designed with UML to its implementation phase in Cormas (Le Page and Bommel 2005). Similarly, the SYLVOPAST computer-assisted role-playing game (Etienne 2003) also sprang from a training session (organized in December 1999). Since then, it has been used many times to let trainees experience the potentialities of tools like role-playing games to support collective decision-making processes. In the next section, we analyze Cormas-linked publications with a particular focus on the relation between authors and the Cormas-user community. We conducted a survey with Google Scholar on September 21th 2010 by searching for the keyword "Cormas" located anywhere in articles. After checking the validity of each individual result, we ended up with a collection of 270 publications. References—denoted M—describing a specific model developed with the Cormas platform (focused on the model representing a given socio-ecosystem) were differentiated from references —denoted P—related to the Cormas simulation platform itself. 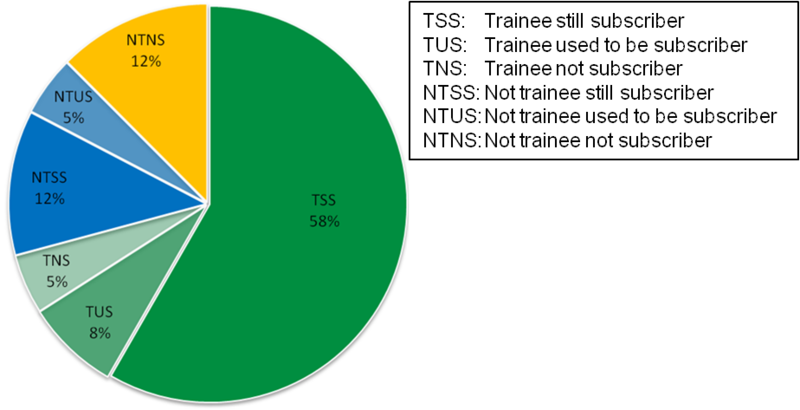 M papers represent 54% of the total (see figure 6). The majority (59%) of the P papers (denoted P0) just mentioned Cormas in passing as one of the existing ABS platforms while 41% (denoted P1) provided a description of the Cormas platform and addressed methodological issues (see figure 6). To characterize the diversity of M references, several dimensions were analyzed. The first one deals with the location of the Cormas model on a spectrum ranging from the most theory-driven to the most evidence-driven (Moss 2008). A theory-driven model is strictly the computational implementation of some theoretical features. Such models are usually abstract, and not connected to any specific context like the one already mentioned in the field of geography (Bonnefoy 2000). 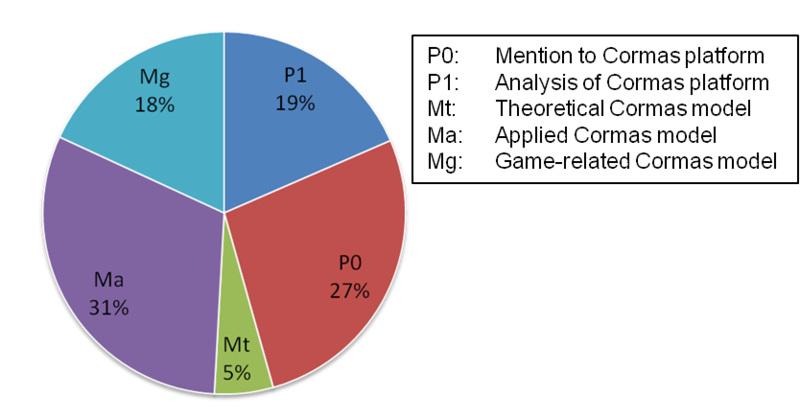 This subcategory, denoted Mt, represents only 10% of the whole M category. On the opposite side of the spectrum, an evidence-based model straightforwardly integrates information about a given socio-ecosystem into a simulation model, and therefore enables a better understanding of the system and the exploration of contrasted management scenarios. It is related to what Janssen and Ostrom (2006) called "case study analysis" in their typology of empirical approaches to ABS, along with i) role-playing games (interactive simulations based on situations in particular communities in which participants play the roles they play in real life, enabling the elicitation and sharing of representations) ii) laboratory experiments (very precise hypotheses tested in a highly abstract and controlled environment to compare alternative models of human decision making); and iii) stylized facts (empirical facts that arose similarly in various statistical studies). Case study analysis (denoted here Ma) and role-playing game (denoted here Mg) focus on the context in which particular subjects make their decisions. These two types are the most common types of models implemented with Cormas (31% and 18% respectively, see figure 6). As illustrated in figure 7, the number of theoretical models identified began to decrease after the fourth year. Thereafter, models developed with Cormas were predominantly applied ones. What is most remarkable however, is the steady increase in the use of Cormas to support role-playing games, and this since the early days of the platform (see the trend of the Mg category in figure 7). 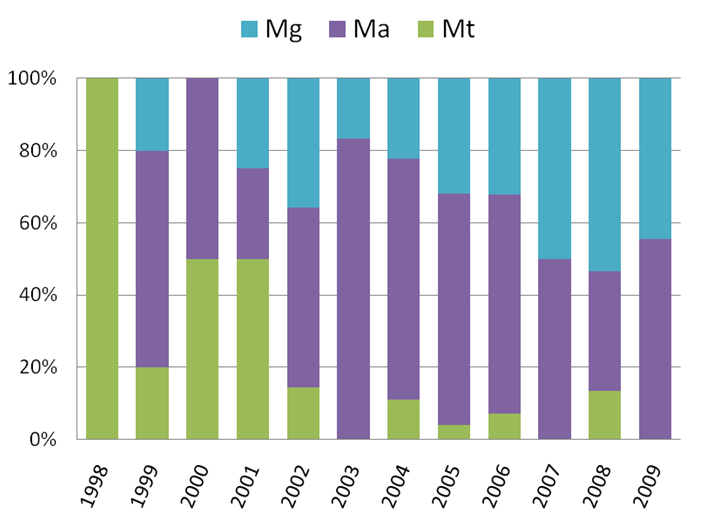 Today the Mg category accounts for half of the publications that describe a model implemented with Cormas. Among the thematic issues addressed in Cormas models, agriculture, land use / land cover changes (LUCC), water and forest management, are the four main domains of application (see figure 8). 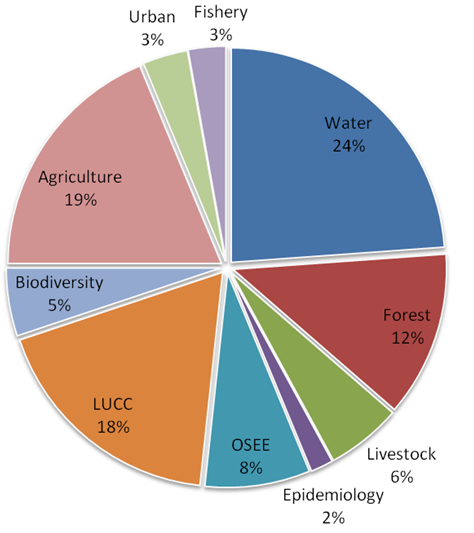 Published models developed with Cormas also tackle issues related to organization and socio-economic exchanges (OSEE category in figure 8), livestock management and biodiversity. When looking at the evolution of the thematic issues addressed over time, agriculture has always been a prominent application domain, as the Cormas development team belongs to the CIRAD Institute, which is specialized in agronomy. Additionally, as Cormas has advanced spatial representation features, LUCC issues are frequently addressed. 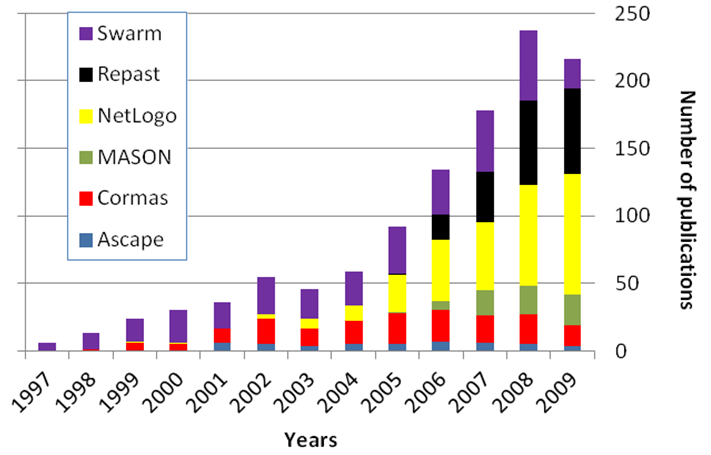 Epidemiology, fishery and urban applications (including criminology) are new application domains that have emerged since 2005. 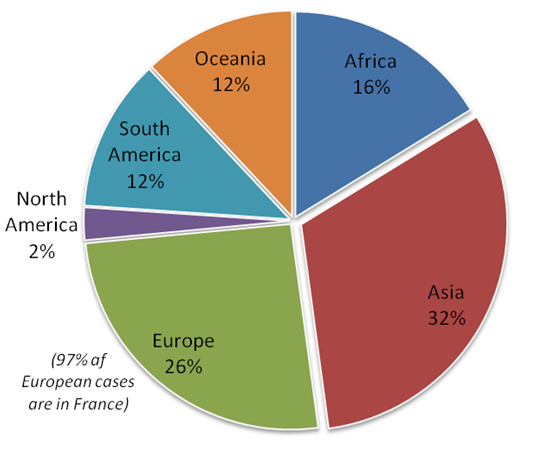 Another Cormas specificity is that two-thirds of the models deal with case studies located in developing countries (see figure 9). Once again, this has to do with CIRAD's research focus, even if users outside CIRAD are also contributing to this specificity (e.g. Saqalli et al. 2010; Rebaudo et al. 2011). In addition, the fact that Cormas training sessions took place at locations in different corners of the world heavily influenced the geographic distribution of models. For instance, in South America the training sessions led to the development of several models based on local issues. This trend was observed for all the different locations. Most of the Cormas applications in Europe are French, which is not surprising as the platform was developed in France. Now that we have defined what exactly the Cormas user community is, and analyzed publications based on Cormas models, we propose to merge these two sets of data so that the interactions between publishing a model developed with Cormas and the Cormas user community itself can be more easily understood. 20% of Cormas course attendees published, as first author (or as co-author), a paper about a model developed with the platform. As all the authors of a single publication are not necessarily linked to the community in the same way (e.g. some may have been trainees, some not) we assigned a global author indicator to all the M references defined as one of the 6 indicators proposed in table 2 for individual members. To achieve this, we selected from all the co-authors of a single publication the strongest linkage to the community for both the attendance to a training session and the subscription to the electronic forum. For instance, if a co-author was a trainee but never participated in the forum and another co-author still subscribes to the forum but never attended a training session, the publication was classified in the TSS category (see table 2). Figure 10 presents the distribution of the Cormas model publications according to this principle. 71% of the publications are authored by at least one person who attended a training session. Most of the people who expressed an interest in the Cormas platform were not familiar with agent-based modeling and object-oriented programming. Therefore, they felt the specific need to learn how to quickly move from envisioning what an ABM related to their research topic would look like to being able to design, implement and run a concrete prototype ABM. To this end, a training session is the most appropriate way. Figure 10 also shows that 12% of the Cormas model papers are published by people who neither attended a training session nor ever subscribed to the electronic forum (NTNS category). 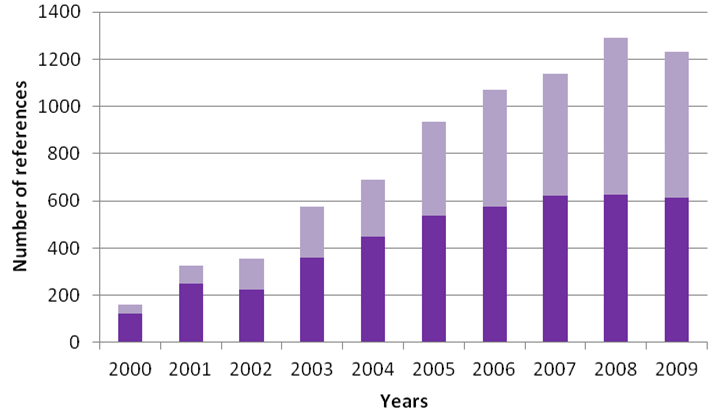 This proportion increased over time, to reach one-third in 2009 (see figure 11). This trend can be explained by the availability, since 2005, of online tutorials demonstrating how to design and operate models with Cormas. For instance, the use of Cormas to implement the successive versions of the StupidModel benchmark proposed by Railsback and his colleagues (2006) has been recorded step by step. As soon as a simulation platform starts to be used by people outside the designer core group, a user community emerges. The main benefit of being a member of the community is related to the ease in mastering the simulation platform. The resources available to the community members are an electronic forum and a dedicated website providing a library of existing models, a list of publications, tutorials, etc. Additionally, the organization of events that allow face-to-face interactions between community members helps cement the user community. Such events are typically introductory courses designed to train participants. They exist for all the platforms mentioned in this article and may sometimes be expanded through advanced courses. In addition, distance learning can also be used, especially when the focus is on technical aspects. E-learning modules, such as the one developed on Cormas, therefore provide a flexible way to incite people to use the tool when they wish to do so. Events allowing face-to-face interactions between community members also give them the opportunity to present new or tentative results and to talk about methodological issues. SwarmFest, which is organized annually since 1997, is a good example of this kind of informal conference (summer seminar) where participants sharing a common interest in agent-based modeling in general, and methodological implementation issues in particular, can regularly meet. Unlike unspecialized agent-based simulation platforms such as Repast, Swarm or Netlogo, Cormas also federates its user community through a shared thematic interest in participatory approaches designed to address renewable natural resource management issues. The companion modeling approach that involves local stakeholders as well as scientific domain experts in the modeling process (Barreteau et al. 2003; Etienne 2011) was initiated by researchers from the Green research unit at CIRAD (Bousquet et al. 1999). Role-playing games are now recognized as powerful empirical tools to support the collective design and refinement of evidence-driven agent-based models providing realistically descriptive specifications of individual behavior and social interaction (Janssen and Ostrom 2006; Moss 2008). During the last decade, a batch of such computer-assisted games related to natural resource management have been developed with Cormas (Bousquet et al. 2002; Etienne 2003; d'Aquino et al. 2003; Castella et al. 2005; Mathevet et al. 2007; Adamatti et al. 2009; Cleland et al. 2010; Souchère et al. 2010; Dumrongrojwatthana et al. 2011; Gourmelon et al. 2011). Today, just like in its early development stage, the evolution of Cormas is driven by its user community needs. Whereas 10 years ago the focus was more on spatial features, it has now switched to facilitated interactive simulation. 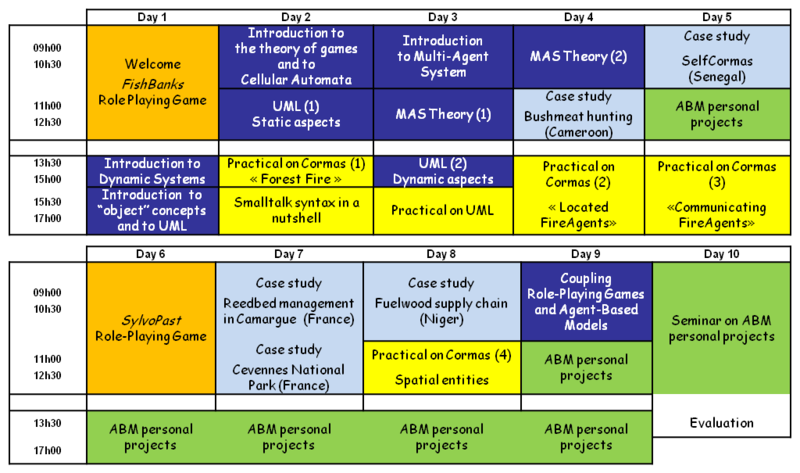 In this paper, we described how the Cormas platform has been used for 12 years as an artefact to foster learning about agent-based simulation for renewable resource management. More than 50 training sessions were organized all over the world. A library of didactic models has been built over time. By manipulating these simple models, inexperienced programmers were getting started with the Cormas platform and the syntax of the Smalltalk object-oriented language. Straight after this initial discovery phase, the trainees followed up with the design and the implementation of a prototype agent-based model related to their case study. Many applications developed with Cormas are models of socio-ecosystems intended to be used to raise the awareness of the stakeholders (including scientists) of the variety of points of view and their consequences in terms of resource management. This is why the Cormas user community is regarded as a group mainly interested in context-specific participatory agent-based simulation. <!-Acknowledgements here --> We are grateful to Jarlath Slevin for his help in correcting and improving the English used in the paper. ADAMATTI, D.F., Sichman, J.S. and Coelho, H. (2009). An Analysis of the Insertion of Virtual Players in GMABS Methodology Using the Vip-JogoMan Prototype. Journal of Artificial Societies and Social Simulation, 12(3), 7. http://jasss.soc.surrey.ac.uk/12/3/7.html. BARRETEAU, O. and others (2003). Our Companion Modelling Approach. Journal of Artificial Societies and Social Simulation, 6(2), 1. http://jasss.soc.surrey.ac.uk/6/2/1.html. BARRETEAU, O., Le Page, C. and d'Aquino, P. (2003). Role-Playing Games, Models and Negotiation Processes. Journal of Artificial Societies and Social Simulation, 6(2), 10 http://jasss.soc.surrey.ac.uk/6/2/10.html. BOUSQUET, F., Barreteau, O., Le Page, C., Mullon, C. and Weber, J. (1999). An environmental modelling approach: the use of multi-agent simulations. In F. Blasco & A. Weill (eds. ), Advances in environmental and ecological modeling (pp. 113-122). Paris: Elsevier. BOUSQUET, F., Barreteau, O., d'Aquino, P., Etienne, M., Boissau, S., Aubert, S., Le Page, C., Babin, D. and Castella, J. C. (2002). Multi-agent systems and role games: an approach for ecosystem co-management. In M. Janssen (Ed. ), Complexity and ecosystem management: the theory and practice of multi-agent approaches (pp. 248-285). Northampton: Elgar Publishers. CASTELLA, J. C., Trung, T. N. and Boissau, S. (2005). Participatory simulation of land-use changes in the Northern Mountains of Vietnam: the combined use of an agent-based model, a role-playing game, and a geographic information system. Ecology and Society, 10(1), 27. http://www.ecologyandsociety.org/vol10/iss1/art27. CASTLE, C.J.E. and Crooks, A.T. (2006). Principles and Concepts of Agent-Based Modelling for Developing Geospatial Simulations. Working paper 110. London: Centre for Advanced Spatial Analysis (University College London). D'AQUINO, P., Le Page, C., Bousquet, F. and Bah, A. (2003). Using self-designed role-playing games and a multi-agent system to empower a local decision-making process for land use management: The SelfCormas experiment in Senegal. Journal of Artificial Societies and Social Simulation, 6(3), 5. http://jasss.soc.surrey.ac.uk/6/3/5.html. DROGOUL, A., and Ferber, J. (1992). From Tom Thumb to the Dockers: some experiments with foraging robots. In J. A. Meyer, H. L. Roitblat and S. W. Wilson (Eds. ), From Animals to Animats: Second Conference on Simulation of Adaptive Behavior (pp. 451-459). Cambridge: MIT Press. ETIENNE, M. (2003) SYLVOPAST: a multiple target role-playing game to assess negotiation processes in sylvopastoral management planning. Journal of Artificial Societies and Social Simulation, 6(2), 5. http://jasss.soc.surrey.ac.uk/6/2/5.html. FERBER, J. (1999). Multi-Agent System: An Introduction to Distributed Artificial Intelligence. Harlow: Addison Wesley Longman. GUECHTOULI, W. (2009). Dynamique du processus de transfert de connaissances au sein d'une communauté de pratique : Une modélisation multi-agents. PhD thesis, University Paul Cézanne, Aix-Marseille III. GOURMELON, F., Rouan, M., Lefevre, J.-F., and Rognant, A. (2011). Role-Playing Game and Learning for Young People About Sustainable Development Stakes: An Experiment in Transferring and Adapting Interdisciplinary Scientific Knowledge. Journal of Artificial Societies and Social Simulation, 14(4), 21 http://jasss.soc.surrey.ac.uk/14/4/21.html. JANSSEN, M. (Ed.). (2002). Complexity and ecosystem management: the theory and practice of multi-agent approaches. Northampton: Elgar Publishers. JANSSEN, M. and Ostrom, E. (2006). Empirically Based, Agent-based models. Ecology and Society, 11(2), 37 http://www.ecologyandsociety.org/vol11/iss2/art37/. KÜHNE, T. (2001). A SmallTalk for Students - A Giant Leap for Studentkind, Part 1. Journal of Object-Oriented Programming, 14(1), 19-25. LE PAGE, C. and Bommel, P. (2005). A methodology for building agent-based simulations of common-pool resources management: from a conceptual model designed with UML to its implementation in CORMAS. In F. Bousquet, G. Trébuil & B. Hardy (eds. ), Companion Modeling and Multi-Agent Systems for Integrated Natural Resources Management in Asia (pp. 327-349). Los Baños: IRRI. LE PAGE, C., Abrami, G., Barreteau, O., Becu, N., Bommel, P., Botta, A., Dray, A., Monteil, C., Souchère, V. (2011). Models for sharing representations. In M. Etienne (ed. ), Companion Modelling. A participatory approach to support sustainable development (pp. 69-96). Versailles: Quae. MOSS, S. (2008) Alternative approaches to the empirical validation of agent-based models. Journal of Artificial Societies and Social Simulation, 11(1), 5 http://jasss.soc.surrey.ac.uk/11/1/5.html. MINAR, N., Burkhart, R., Langton, C. and Askenazi, M. (1996). The Swarm simulation system: A toolkit for building multi-agent simulations. Working Paper 96-06-042. Santa Fe: Santa Fe Institute. NIKOLAI, C. and Madey, G. (2009). Tools of the Trade: A Survey of Various Agent Based Modeling Platforms. Journal of Artificial Societies and Social Simulation, 12(2), 2 http://jasss.soc.surrey.ac.uk/12/2/2.html. PARKER, M. T. (2001). What is Ascape and Why Should You Care? Journal of Artificial Societies and Social Simulation, 4(1), 5 http://jasss.soc.surrey.ac.uk/4/1/5.html. REBAUDO, F., Crespo-Perez, V., Silvain, J. F., and Dangles, O. (2011). Agent-Based Modeling of Human-Induced Spread of Invasive Species in Agricultural Landscapes: Insights from the Potato Moth in Ecuador. Journal of Artificial Societies and Social Simulation, 14(3). 7 http://jasss.soc.surrey.ac.uk/14/3/7.html. THEBAUD, O. and Locatelli, B. (2001). Modelling the emergence of resource-sharing conventions: an agent-based approach. Journal of Artificial Societies and Social Simulation, 4(2), 3 http://www.soc.surrey.ac.uk/JASSS/4/2/3.html. TOBIAS, R. and Hofmann, C. (2004). Evaluation of free Java-libraries for social-scientific agent based simulation. Journal of Artificial Societies and Social Simulation, 7(1) 6 http://jasss.soc.surrey.ac.uk/7/1/6.html. WILENSKY, U. (1999). NetLogo. Evanston: Center for Connected Learning and Computer-based Modeling, Northwestern University http://ccl.northwestern.edu/netlogo/.